When a movie starts against a firing squad wall,its time to crack that bottle of Cuervo. 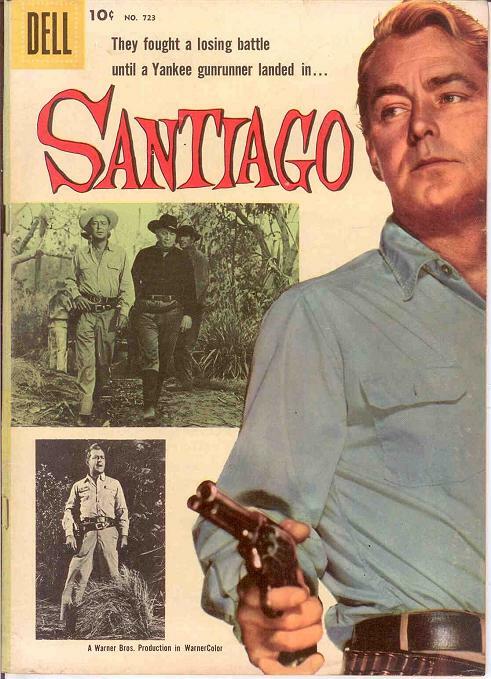 SANTIAGO, a neglected 1956 Alan Ladd adventure, is typical action fare from its era; fun and dumb. Actually, it did fair business for an unpretentious little star vehicle. Gun-runners in Cuba, 1895: one (Ladd), noble under his veneer of self-interest, another (Lloyd Nolan), nasty enough to sell out his dear old Ma. 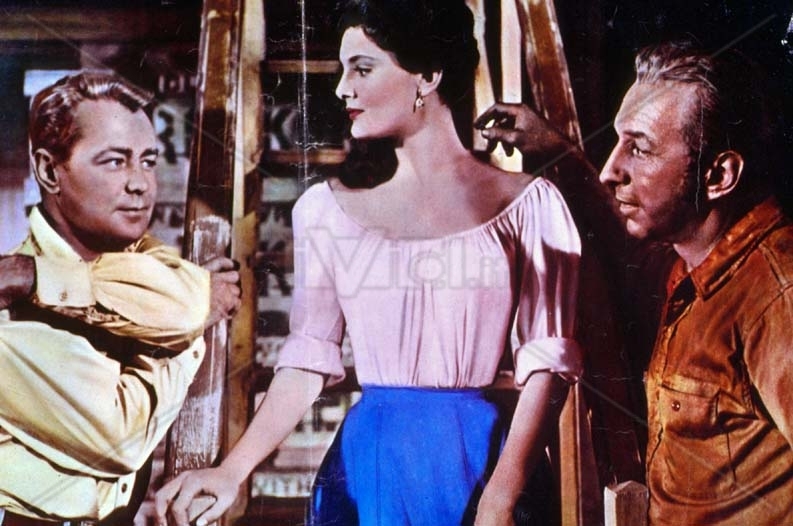 In between is—of course—‘The Woman’, here named ‘Dona Isabella’ (grabbed from the screenwriters bag of hoity-toity hot-blooded Latin damsels), played by 22-year-old Italian import Rossana Podesta, who was getting a big Warner’s push that year with Helen of Troy. This time, in the Caribbean, she launches not a thousand ships but a M’sippi paddle wheeler, piloted by bourbon-powered scene-stealer Chill Wills. Load up stoic Ladd, snide Lloyd ,some shiny guns and shove off for ‘Cuba libre’. Which rogue will win Dona Isabella’s revolutionary ardor? 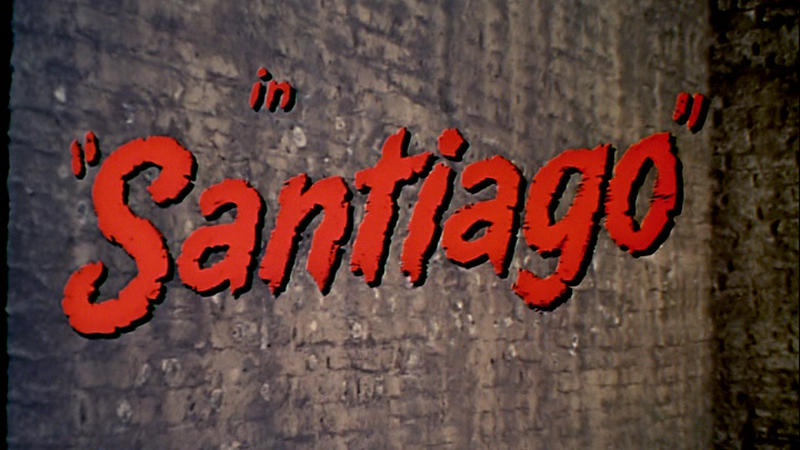 Some fun exchanges of tough-guy dialogue (Nolan’s a kick); some recognizable supporting rascals for the good/bad gangs—Paul Fix, Frank de Kova, L.Q.Jones, Royal Dano; an irritating kid we’re supposed to be charmed by, ‘act-arduous’ trekking in the palm trees, villainous Spaniards. Dependable Warner’s workhorse Gordon Douglas directed with his typical unsung efficiency, putting some real panache into a dandy ambush scene rough enough to serve as a model. Scored with some zest by the unheralded David Buttolph, racking up another notch on an endless line of credits. Henchman Frank De Kova just waiting for boss Nolan to give him the OK to knock off Alan’s Panama. 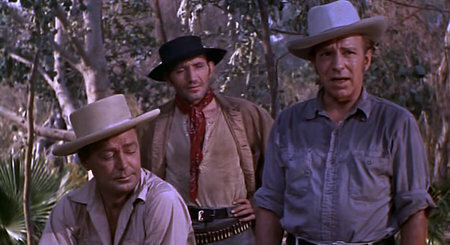 Podesta/Isabella gets to tell Ladd/’Cash Adams’ that the Cuban rebels (engaged in something like a conga, after getting weapons–go figure) bear “hatred in their souls, but not in their hearts.” If one crept out on a limb to claim this is a notable movie, the branch would snap and you would plunge onto the studio jungle floor, but as a toss-back-some-with-an-old-buddy-and-chuckle item, it’s an enjoyable 93 minutes that recall the innocence of Saturday matinées past. It shot its way into 51st place for the year, grossing $5,700,000. They used to make comic books out of movies. Now its the other way around. Search for the meaning.